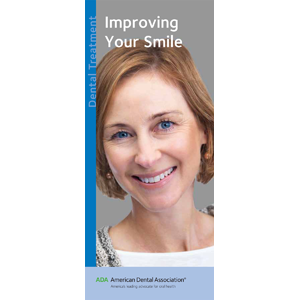 This brochure is an essential tool in helping patients visualize more beautiful smiles. After opening with a smile quiz, it gives an overview of many different cosmetic treatments available to dentists and their patients: tooth-colored fillings, whitening, veneers, braces, enamel shaping, and crowns. Before-and-after photos show just how attractive a smile improvement can be. 6 panels. Minimum order 150. Click Add to Cart then personalize for free. Now you can add personalized information on the front, back, or both covers on all brochures.